Remember back in June when I reviewed that gorgeous floral eShakti dress? Well, I ended up taking advantage of the buy 2 get 1 free offer and got this beauty. 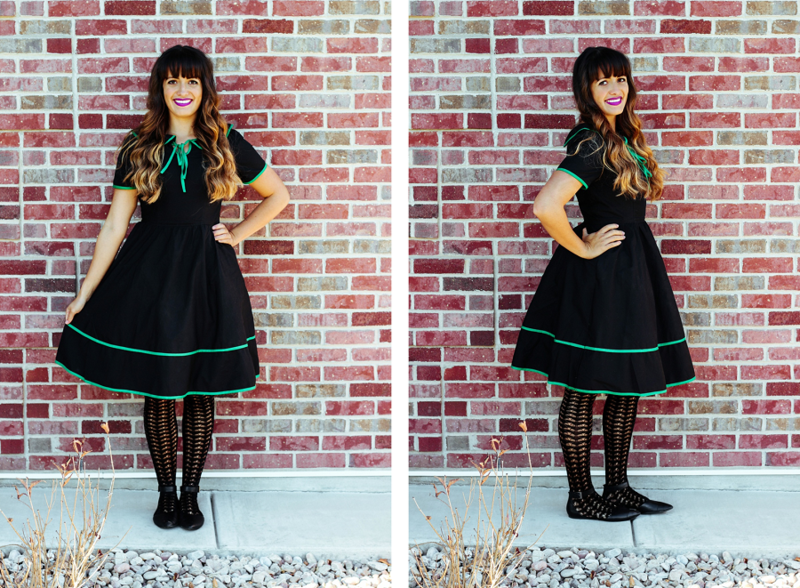 I loved the peter pan collar and thought the green trim was so cute. This exact dress is no longer available on their site but they have the exact same dress in navy with white trim available! eShakti offers FREE customization with your first order which I love and totally took advantage of by purchasing 3 dresses in my size. 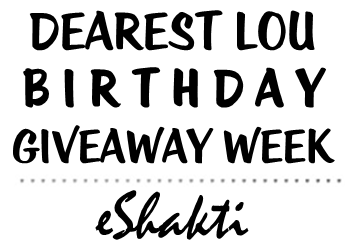 eShakti is offering one lucky Dearest Lou reader a $50 gift card that can be used over and above any other promotional offer/gift coupon in the same order. To enter, simply visit eShakti and start browsing for your favorite item. Remember to fill out the rafflecopter widget below, the more entries you complete the better chance you have of winning. Giveaway is open to US residents only thru October 28 at 11:59PM EST. If your twitter, facebook, or instagram profile is on P R I V A T E please set your settings to P U B L I C on November 3, 2014 from 12AM EST- 3AM EST since I will be verifying the random winners entries at that time. Winners will be announced on my birthday, November 3 and contacted via email November 4. Winners will have 48 hours from the time I send the email to claim prize before another winner is selected at random and notified. Thanks friends and good luck. Oh I love so many of their dresses! I think I'd get a fit and flare dress! I love the owl embellished dress, and the bow tied floral dress. I'd have to agonize for a little while to pick between the two! love the embellished striped poplin skirt! I have always wanted an eShakti dress! Being so tall it's really hard to find dresses that are "classroom appropriate" and eShakti's are awesome. I like the Quilted jacquard ponte bomber jacket. I love the fall florals contrast poplin dress! Thanks for the giveaway and happy birthday! I would get the Jessica dress-it's so classy and pretty! I'm loving the floral yoke high-low hem top! So cute! I would get the Tiered floral cotton print tunic if I won the $50 gift from eShakti. I like the Trapunto trim cotton poplin dress. I would use this towards the Tux front lace dress. I love the 50s inspired poplin dresses. I would use the store credit to buy the Floral embellished tulle dress. It is exceptional! I love the customization option and the Violet dress would be perfect for holiday parties. I would love to get the Tartan plaid pleat dress! I'd get the Gold jacquard lace dupion dress! I would get the Graphic floral lace blouse!